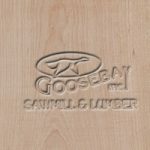 Yellow Birch - Goosebay Sawmill and Lumber, Inc.
Yellow birch is essentially the sapwood of the black birch or yellow birch tree. Both have a creamy yellow sapwood and a darker reddish brown heartwood, with the black birch having a deeper colored and redder heartwood. The wood has a fine, even texture and is classified as heavy and strong. It is very hard with a relative rating of 1470. Distribution of birch trees is principally in the Northeast and Lake states, growing as far south as northern Georgia. The birch we stock is most commonly “unselected,” meaning that it is not sorted for color between heartwood and softwood. Most pieces in our bin will display both heartwood and sapwood, but will overall be more “yellow” than “red.” Let us know if you need all sapwood and we can special order a “sap yellow” grade for you. Figured yellow birch is commonly referred to as “curly birch.” It has a much looser and more open “curl” pattern than does curly maple. Birch has a wide variety of uses including furniture, flooring, baskets, interior woodwork,and doors. Veneered plywood (lighter colored) is widely used including in the making of.doors, furniture, paneling, and cabinets.